Outbreak review by Namcodude. 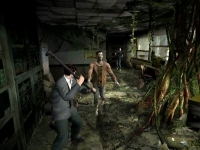 This review is based on the Japanese version of the game, Biohazard Outbreak. 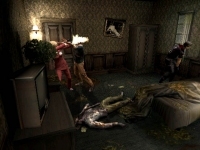 The game consists of five non-linear scenarios that are named after the main events and settings, and consequently, each character has his/her ending in each scenario. You basically start off with one scenario and you unlock the others as you progress. The first scenario starts off with the outbreak in the city, and is appropriately titled "Outbreak", and upon finishing it, you unlock the next one that takes place in Umbrella's underground lab from RE2 titled "Below Freezing Point" and so on. Finishing a scenario is a linear task, but completing one properly isn't. The game has a scenario route setting (with a completion percentage) similar to Onimusha 2's where you have to replay each scenario a few times to complete them fully. It's not an easy task though and requires some patience. As I mentioned earlier, the core of the game itself remains the same for the most part: explore, find items, solve puzzles, and then move on, but there are several modifications and new features that are introduced in the game. For starters, you're given true analogue controls as well as the traditional ones, but in both cases, the controls are very responsive. The items menu is realtime now, so you're vulnerable to attacks while you're mixing herbs or exchanging items. You can also reload your weapons without going into the menu by standing still and holding L1; the longer you hold the more bullets you load because clips are special items in the game for standard handguns. 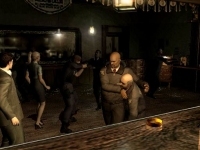 And best of all, shaking out immediately when you're grabbed by an enemy results in a new defensive technique where your character shoves away the enemy and fires a single shot to push it (the enemy) away. The zapping system has been vastly improved to accommodate the game's online mode, so to exchange items, one has to request it and then it's up to your partner(s) if he/she is feeling generous enough to share. To elaborate further, you press start to go into your items menu and if your partners are in the same area, theirs is going to be displayed as well. Simply highlight an item you want and click it; your character will shout out "I need that." or Kevin's hilarious line of "Can I have it pretty please?!" That particular partner will then move closer to you and hold out his/her hand with the item in place for you to pick it up (in the offline mode with the AI partners), that only happens if they're willing to share of course.. Getting rid of items is done in a similar manner; of course, your character will be the one holding out his/her hand, and then it's first come, first serve. 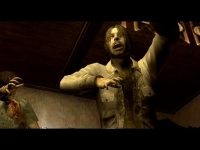 The enemy AI is decent, but it doesn't break any new grounds in the series with the exception of the zombie behavior. For one thing, they follow you everywhere (with the exception of very few safe rooms) until they're completely dead, and you can only be sure they're dead with they disappear (the actual model flickering off). Also, navigating past zombie almost never works because they're able to lunge at you with their fists, and even sideways with a hook. This may sound far fetched but it doesn't work like a beat 'em up; if you get hit, you can move past them but as mentioned earlier, navigating past them gets you punished almost always. With no item boxes around, you're given the option to swap items on the fly should your inventory be full. For example, say you're in need of a certain key item but your inventory is full with herbs and healers, so in this particular case, you can simply highlight the herb you wish to swap the key item for. The herb/healer will remain in that particular spot until someone picks it up. This swapping method works with the item exchange process with partners as well, so technically, you always have space to work around with, you just have to manage it carefully. There are a couple of major additions to the gameplay engine with the introduction of the virus gauge, and character specific abilities with a minor change to the combat system. The virus gauge is exactly what it sounds like: a T-virus gauge that lets you know of the percentage of contamination in your body. The gauge rises at a slow rate right from the start, but that rate will go up if you receive any substantial amount of damage, but a healer item will take care of that, and temporarily stop the spread of virus in your body. There are also different types of pills that you find throughout the game that stop the infection temporarily, some longer than others. The damage system is modified slightly to work better with the virus gauge. Once you reach the danger status and you get hit, your character falls on the ground and starts crawling while the gauge goes up at an alarming rate. A partner can help you stand on your feet (and you can do the same for another in need by moving closer and holding circle), and then give you a healer to get back in the game. The game's save system no longer requires ribbons, though a save in Outbreak is really a temporary continue point that gets deleted once you load it (the game automatically is reset once you save). This might sound harsh, but it's very appropriate given the average length of the scenarios which is about 1.5-2 hours per scenario the first time around.